Quick apologies for my absence. I recently moved. Just a few miles, but into a house. A grown-up house. It is amazing and stressful and overwhelming and fun. Not only did that take a bunch of time, but I was cooking out of a microwave and electric skillet for several days. 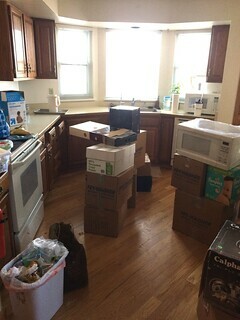 Sadly, this photo was an improvement on the unpacking of my kitchen at one point. But now I’m all unpacked and ready to go! Last week, I had a guest post on The Kitchen Professor on Cornbread in a Cast-Iron Skillet. It is one of my favorite uses for cast iron skillets. Check it out! And, if you are looking for something to go with that cornbread, I have a recipe featuring another specialized pot quickly becoming one of my favorites. The pressure cooker. Several food blogs I follow have posted about pressure cookers in recent months. Last summer, as I was packing my kitchen, my friend commented on how nice my pressure cooker was. I told her it was because I had never tried it. Now that I’m all unpacked, I’ve been testing it out. It’s pretty great. Brown rice only takes 20 minutes to cook! With the recent demise of my rice cooker, this has been a life saver. But my real favorite is beans. While the beans in my crockpot are great and easy, pressure cooker beans are so quick. I have generally soaked mine, but you don’t need to do so. Beans are a nutritious, filling, and affordable meal. 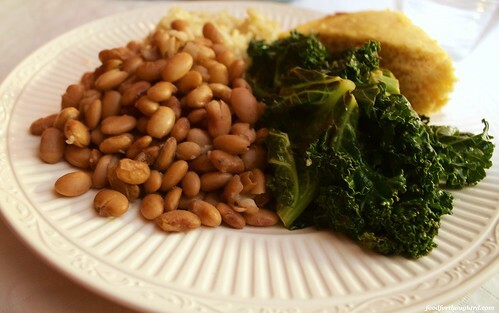 Beans, cornbread, and a side of greens. Very Southern and very delicious! Enjoy! This isn’t an exact recipe. Just some ideas and resources I have found helpful. 1. Optional: soak beans in 6-8 cups of water for 8 hours or overnight. Drain water. 2. Combine beans, aromatics, salt, and water in pressure cooker. Make sure you don’t fill your pressure cooker more than about ½ full. 3. Cook according to your cooker’s guidelines. Here is useful information about cooking times and adjusting for altitude, etc. 4. VERY IMPORTANT!! Let the pressure release naturally, which will take 10-15 minutes. You can put the cooker under cool water to fast release the pressure. However, you will have weird beans. The beans in my picture were cooled that way. Some were slightly underdone. Lots of cracked beans. Have patience and let it release naturally. Totally worth the extra time. What do you like to cook in a pressure cooker? What do you wish you knew how to cook in a pressure cooker? Let me know in the comments and I’ll experiment for you!